If you're in New York, join us at McNally Jackson Books in Soho at 7pm to celebrate the third issue of Assignment. We’ll feature readings by Christine Smallwood, Anna Summers, and the winner of the 2017 Assignment MFA Student Writing Contest, David Moloney. Sarah Foil-- Wolf In White Van by John Darnielle is a salute to a margin of the population that is often overlooked, stereotyped, and laughed at: the people who meet once a week for Dungeons and Dragons with their friends; the people who stay up until 4am in front of their computer screens; the people who have subscriptions at their local comic book stores; the people who sit on the bedroom floor and listen to the same record over and over again. It’s a maze of a narrative that jumps through the life of Sean Phillips, a deformed recluse and the creator of Trace Italian, a popular mail-in role-play game set in dystopian United States. Scenes alternate between different points in Sean’s life, his depressed childhood, the creation of Trace Italian, and the tragedy of two teens who attempt to follow his game in the real world. Darnielle’s debut novel is beautiful and heartbreaking. The plot is one that will stay with its readers long after they finish the last page. As a writer, it leaves me striving to do more. Eddie Dzialo-- While listening to records with a friend, he told me that music works its way into our DNA and becomes a part of us. Singing it, tapping its rhythms becomes instinctive. Phish is that music for me. Strangely enough, at my first seventh-grade dance, the DJ played “Down with Disease” as the last song of the night. Coming home from Iraq, I was on a satellite phone with my mother trying to find a way to buy tickets for their reunion show at the Hampton Coliseum. My wife and I chose a Phish song for our first dance at our wedding. In Afghanistan, I listened to 40gb of Phish shows I’d stuffed into my iPod before deploying. Puterbaugh’s biography explains how Phish built a career around fans whose allegiance dwarfs my own. More importantly, it details why someone would follow Phish around for a leg of a summer tour, listening to hours of improvised music, selling grilled cheeses in a parking lot to fund getting to the next show. Phish spent decades learning to speak through a musical language that they invented, a language their fans heard and integrated into their lives. Puterbaugh’s biography conveys deep understanding of that language. Megan Gianniny-- One of my favorite short fiction discoveries this year was the Tor.com novellas, ranging from Lovecraftian retellings to Afro-futurist space adventures. 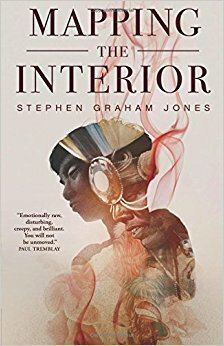 Mapping the Interior by Blackfeet author Stephen Graham Jones is a quieter story of a boy haunted by the ghost of his father, and the mysterious circumstances of his father’s death before his family left the reservation. Junior’s story is as much about the struggles of life with a single mother as it is a ghost story. He defends his sickly brother from bullies, faces off against an angry neighbor, and makes up stories about the trash in the yard to pass the time. But when night comes, Junior maps his house to figure out the path his father’s ghost is taking, and what he can do to help his father return to them. Jones’ ending snuck up on me and was utterly chilling, as good horror should be. But despite the ending, the scariest parts of the story were how the darkness and grief stay with Junior long after the ghostly visits have ended. The dark humanity of Junior’s story is what makes it so powerful, and makes me want to read more by Jones.